How to watch Guardians of the Galaxy Vol. 2 (2017) on Netflix Egypt! Sorry, Guardians of the Galaxy Vol. 2 is not available on Egyptian Netflix, but you can unlock it right now in Egypt and start watching! With a few simple steps you can change your Netflix region to a country like United Kingdom and start watching British Netflix, which includes Guardians of the Galaxy Vol. 2. We'll keep checking Netflix Egypt for Guardians of the Galaxy Vol. 2, and this page will be updated with any changes. Guardians of the Galaxy Vol. 2 is not available in Egypt BUT it can be unlocked and viewed! 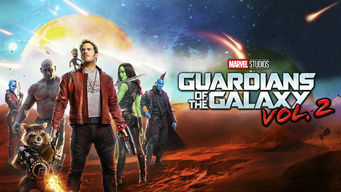 The ragtag, wisecracking band of miscreants known as the Guardians of the Galaxy return to unravel the mystery of Peter "Star Lord" Quill's origins. After a lifetime of searching the galaxy for his father, Peter Quill finds him. And the truth is a little out there. There is a way to watch Guardians of the Galaxy Vol. 2 in Egypt, even though it isn't currently available on Netflix locally. What you need is a system that lets you change your Netflix country. With a few simple steps you can be watching Guardians of the Galaxy Vol. 2 and thousands of other titles! Watch "Guardians of the Galaxy Vol. 2"